In this short, Tom and Jerry are apparently on a cruise somewhere in the Pacific. When Tom sees people surf, he naturally wants to join in. This leads to a cartoon full of gags, one of which is reused from the Disney classic ‘Hawaiian Holiday'(1937), then thirty years old. It also contains one gag that would have made Hanna and Barbera proud if it had been timed better. 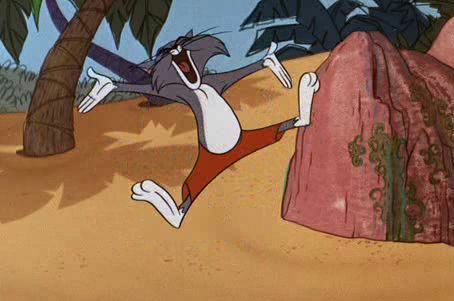 Now, most of the action is plain tiresome, resulting in yet another mediocre entry in Chuck Jones’s Tom & Jerry series. To the previous Tom & Jerry cartoon: The Mouse from H.U.N.G.E.R. « The Mouse from H.U.N.G.E.R.